IT starts the moment you step off the ferry, stand on the jetty and take in that view. Your gaze immediately falls on the golden sands stretching from the resort in front of you to the snorkelling haven known as "The Wrecks" at the extreme far left. You've taken the scenic route and arrived at this island haven. You'd swear you've been teleported to the Whitsundays or North Queensland. Then your eyes turn back to the calm jewelled waters that graduate in colour - deepening from aquamarine to sapphire. Time-poor but fun-loving over-50s can discover a tropical getaway virtually on their doorstep and feel like they've had an exotic holiday in just one or two days. 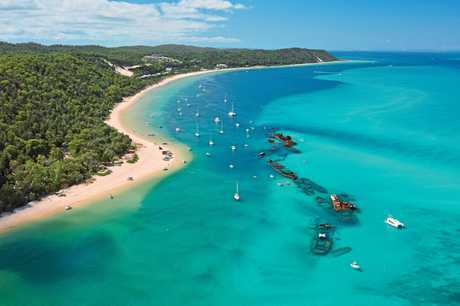 Tangalooma Island Resort on Moreton Island - the world's third-largest sand island after Fraser and North Stradbroke islands - is only a 75-minute ferry ride from Pinkenba in Brisbane's north. It's so close yet a world away from the everyday. While we'd visited Tangalooma before, it had been in the colder months for some winter sun - a time of year when having a scenic water view is enough. Today, it's all about frolicking in the 23C water on a 26-degree day under cornflour-blue skies. And we're not going to waste this opportunity, having taken the first ferry at 7am and cramming as much island time into our overnight itinerary as possible. For our 10am booking with Tangatours on the Wrecks Snorkel Tour, we mosey up the garden path where palm fronds and pandanus leaves cast shadows on to bottle-green lawns to be suited up in wetsuits and decked out with snorkel and fins. Before the mandatory safety briefing, we strike up a conversation with two Swiss travellers from Interlaken who are staying overnight and couldn't pass up the one chance they had to swim around 150 types of coral and 100 species of colourful tropical fish, as well as the possibility of sighting bottlenose dolphins, green sea turtles, wobbegongs and dugongs. Our instructor, the aptly named Sandy, expertly guides us on a tour beside, around and through the 15 wrecks that the State Government deliberately sunk on this beach to provide a breakwall safe anchorage spot for recreational boat owners on the eastern side of Moreton Bay. 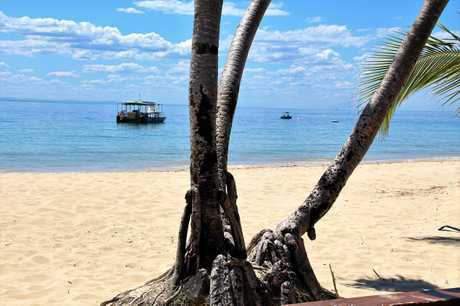 It has also served to create the snorkelling and diving wonderland so close off the beach. The first ship was sunk in 1963 and had a good amount of coral growing around it in three years. Four more ship scuttlings followed in the 1960s, then five each in the 1970s and '80s, with the last in 1984. Sandy tells us the mostly finger coral found here is very slow growing, averaging 6cm every three years. Over the next 75 minutes, we are mesmerised by nature. While I've snorkelled all over the world, this is my first wrecks dive and it's a titanic experience. Nothing can quite describe the feeling of following tiny colourful fish through the bones of a sunken hull of a ship, kicking past portholes and floating above decks. 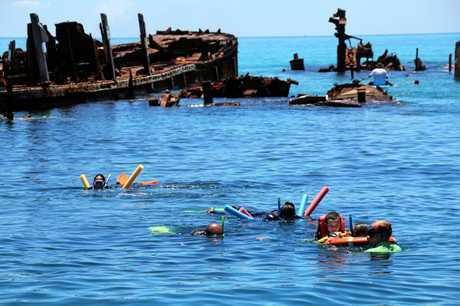 The tour snorkels with the current, the length of the shipwrecks from end to end. Sandy introduces us to wrecks including the Remora and shows us why Trevally Alley and Coral Gardens are so-named, as well as the Fish Tank - where one side of a ship's hull has collapsed, allowing smaller fish to successfully hide from predators. 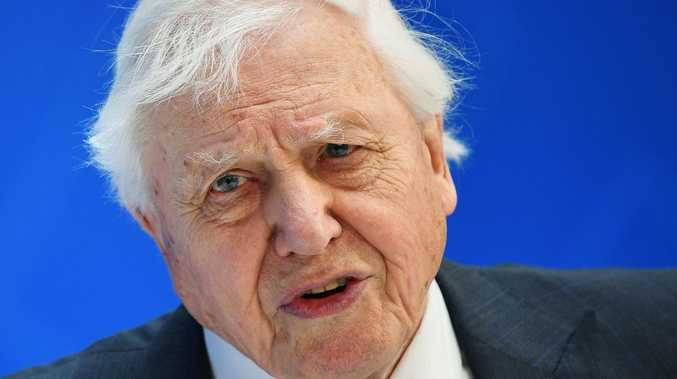 He even tells us where to dive down to observe gropers in their hidey-hole in the hull of a ship. Butter bream, golden trevally, yellow and black-striped sergeant majors, kingfish, yellowtail and a kaleidoscope of tropical coloured fish including lionfish catch our eye or surround us inquisitively. But the highlight is when Sandy points out a napping wobbegong, camouflaged beneath a steel panel. The snorkelling reminds me how the simple things in life are often the best. And with that in mind, we head off to enjoy a half-hour relaxation massage. The gentle sound of waves lap the foreshore in the background and soft and soothing celtic music fills the room as Lara at Wild Dolphin Massage and Beauty does wonders in unlocking the tightness in my neck, shoulders, back and head. So I'm feeling like a new woman over sunset drinks and traditional spicy Sichuan cuisine at the "Fire" side of Fire and Stone (the "Stone" is a la Carte dining with Modern Australian cuisine), where we share a Prawn Mixed Mushroom (garlic prawns stir-fried with Chinese mushrooms), and the Chef's Special Porcupine Barramundi (deep-fried baby barramundi dressed in a coat of crunchy pine nuts and served with a sweet and sour sauce) - a food art surprise. The climax of our day on Moreton Island is its world-renowned Wild Dolphin Feeding. 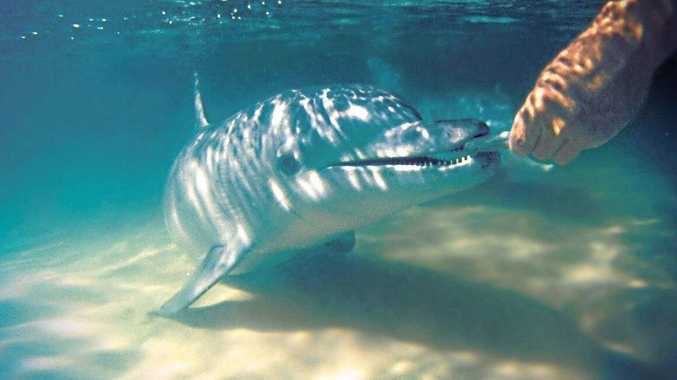 Guests on selected accommodation and day cruise packages can feed dolphins once per person per stay. But anyone can sit in the stands and observe this nightly heartwarming human/dolphin encounter. The recipient of our tasty herrings is pregnant 14-year-old Silhouette (her calf now named Comet made its first appearance on January 13 - the fourth generation of the same family to turn up at Tangalooma and the 12th member of the Moreton pod to frequent the jetty). Silhouette - so-named because of her perfectly formed dorsal fin - has another calf: four-year-old Betts. We are instructed to crouch over, elbow bent with fish in the water at snout height for ease of acceptance. She is eating for two, so that's probably why Silhouette is so eager. Her maternal instincts and motherly nature are on display as she ever-so-gently approaches us, keeping her left eye on me at all times, slowly opening her mouth to reveal her tiny teeth and gracefully accepting her dinner. It's a night-time ritual Silhouette gladly and enthusiastically repeats throughout the year. And after one big day on Tangalooma, I realise she's not the only one who wants to come back for more. Tangalooma operates launch transfer services from Holt Street Wharf, Pinkenba in Brisbane. Passengers travel in comfort across Moreton Bay aboard one of three high-speed catamarans - the Tangalooma Jet, Flyer, and Express. Make the most of your one day away by taking one of the first few ferries from Pinkenba. The final ferry of the day at 9pm takes home the last of the wild dolphin-feeding participants. Many activities are free, while Tangalooma Island Resort also has plenty of paid tours including helicopter joy rides and kayaking. If visiting between June and November, unforgettable three-hour whale-watching cruises are offered. We can also highly recommend quad biking, and the desert safari tour with sand tobogganing. Book tours in advance or head to the Tours Desk next to Reception on arrival at Tangalooma Island Resort. Combination packages will help you save on your trip and partake of all the island has to offer. Whatever your interest, there's a day or night tour for you: segway safari, fishing, scuba diving, banana boat rides, sea scooter safari, marine discovery cruise, fish feeding, clear-bottom kayak tour, sunset cruise, sunset stand up paddle boarding and illuminated wrecks tours. Stay longer than a day in a range of accommodation to suit any budget, including hotel rooms, units, villas and apartments, most with a bay outlook. The three-bedroom, air-conditioned, two-storey townhouse Villas are in a parkland setting only steps from the beach. This home away from home includes downstairs living areas with lounge room, eight-seater dining room table, laundry and kitchen plus three bedrooms upstairs sleeping six. Sit on a choice of two patios, lie on the long sofas or sit up in bed for those inspiring water views of Moreton Bay to the Glass House Mountains on the mainland. If you are staying overnight, perhaps experience more of the raw and rugged beauty of the island coastline: the Northern Safari to Cape Moreton Lighthouse - Queensland's oldest lighthouse - and the eastern beaches, or the new Southern Safari, which includes Mirapool Lagoon and the Big and Little Sandhills, plus an island lunch at the Gutter Bar in Kooringal, including fresh seafood sourced directly from local trawlers, or oysters fresh from local growers. Tangalooma Island Resort 3-night Island Escape from $299pp twin-share. Enjoy up to 40 per cent off when you book a three-night island escape, plus receive 20 per cent off experiences offered by TangaTours. Valid for travel from February 20 -April 4 and April 28 -August 31. Call 1300 652250 or see www.tangalooma.com to book. Subject to availability. Further conditions apply. 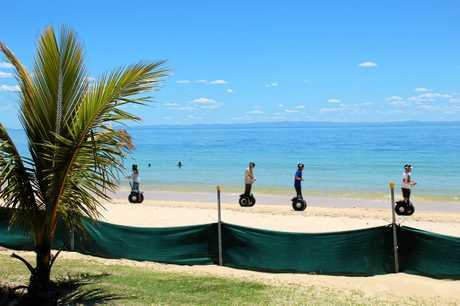 * The writer was a guest of Tangalooma Island Resort: a 75-minute ferry ride from Pinkenba in Brisbane's north to Moreton Island.